I had so much fun working on this little wipe out that I probably added much more detail than I needed too... but it was so much fun, I am such a geek. I have tried this process before a couple of times and found it super frustrating as the paint kept either sticking & lifting off or sliding off the canvas. I was using different ratios of mineral spirits (OMS) and oil in the past and was probably too much as well compared to the ratio of paint. I tried a 60:40 ratio of oil and odorless mineral spirits as suggested by a amazing artist and teacher Terry Strickland. Viola, what a difference, plus I "probably" learned something during my past failed attempts. 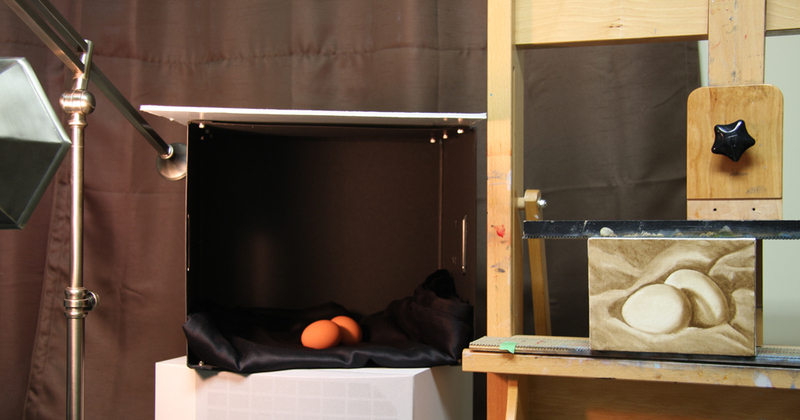 I set up a couple of brown eggs in a black box I bought from IKEA ages ago. I built a still life box awhile back but it took up too much space in my already cluttered studio. I place a black table cloth inside and a piece of foam core on top to block the light. I then placed the eggs inside and adjusted my table lamp so that the light hit the eggs nicely from the side. The box is sitting on top of my sub woofer, total necessity in the studio :) I then mixed up a bit of raw umber paint with the oil and OMS. You could use linseed oil as well but I had walnut oil on hand. I then brushed the paint over the entire canvas working the paint into the weave of the canvas so there were no wipe speck of canvas to deal with later. I then took a cloth and wiped out the basic shapes of the eggs and cloth. 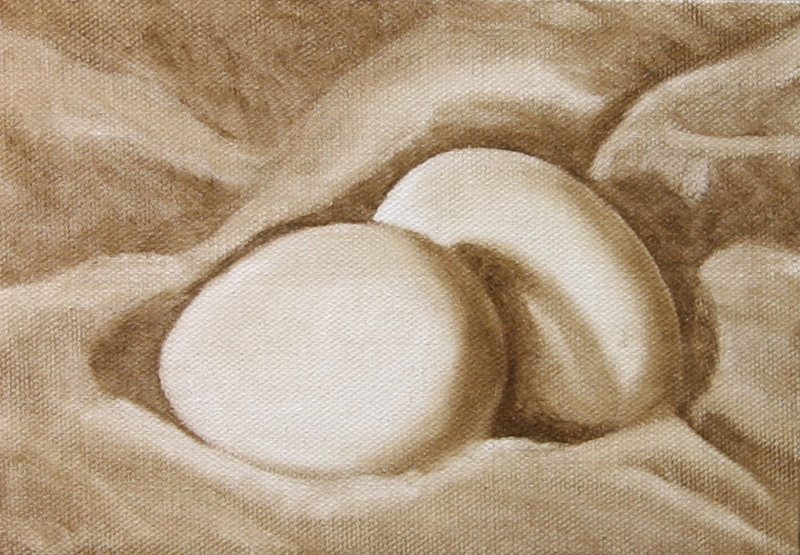 I then added and removed paint using both my cloth and brushes to get the tonal ranges and shapes that I could see. Dipping a brush in the oil/OMS mixture when needed to lift out the lightest values. It is still very rough and there are some areas where the edges of the shapes look a little to hard (now that I look at the photo online) but hopefully they can be softened more subsequent next layers. I am definitely going to play with this technique more in the near future.